VietNamNet Bridge – WHO scientists have joined investigations into a rare skin disease in central Quang Ngai Province's Ba Dien Commune. The disease is suspected to be caused by aflatoxin, a toxin produced by the fungus Aspergillus flavus, which can cause liver cancer in man. 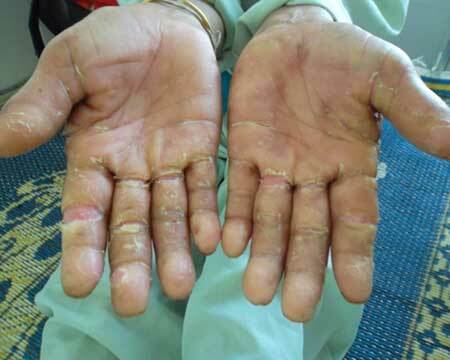 The disease has caused inflammation and lesions on hands and feet and liver of local people since 2011. Sixteen people are believed to be suffering from the disease at present, while one other died of septicemia (a blood disease) at Da Nang general hospital on Monday, believed to be as a result of the disease. The disease was first discovered in Quang Ngai in 2011 and has affected a total of 215 people so far, mainly in mountainous Ba To district. Twenty-three have died. Scientists visited Ba Dien commune on Thursday and checked the environment and food hygiene of residents and took samples of rice and paddies, including mouldy grain. Deputy head of the health ministry's Preventive Medicine Department Nguyen Trong Lan said the inspection showed the commune was quite clean but mould was found in stored rice in many households. Tests showed 36.6 per cent of paddy fields and 10.7 per cent of rice samples, respectively, were contaminated with aflatoxin. Deputy director of Ha Noi-based Bach Mai Hospital Pham Due said aflatoxin was being taken into consideration among other elements such as environmental sanitation and nutrition.